After completing the build on Black Falcon’s Fortress, the second largest set from the 1986 Black Falcons theme, I placed the set on a shelf in my office. 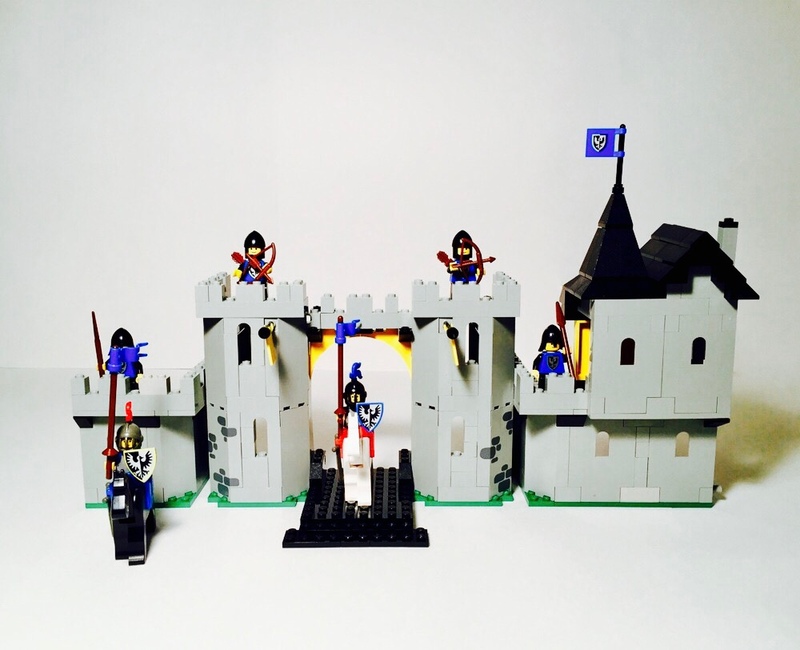 I spent a little time positioning the six minifigs and two horses which are included in the set on and around the castle, and then I took a step back, ready to take in all of this classic set’s retro chic. Well, let me tell you. This set is retro chic, indeed. I happened to place the castle on a shelf directly next to a couple current LEGO sets, and all of a sudden there it was - the evolution of LEGO sitting right there on my shelf. The differences between the modern sets and the 1986 castle were dramatic. I know I’m somewhat stating the obvious by saying old LEGO sets looks remarkably different from new LEGO sets, but this was the first time I’d really seen a tangible representation of LEGO’s progress over the past three decades. Compared to the current set, the Black Falcon’s Fortress was [and is] beautifully and remarkably simple. A set released today of comparable size to the Fortress would almost certainly include a number of printed pieces and, most likely, a decently-sized sticker sheet. On top of that, new bricks have obviously become available since the late 1980s which allow for more detail and realistic brick-built models. This is great for LEGO and great for us, allowing us to build more detailed and more realistic LEGO models. 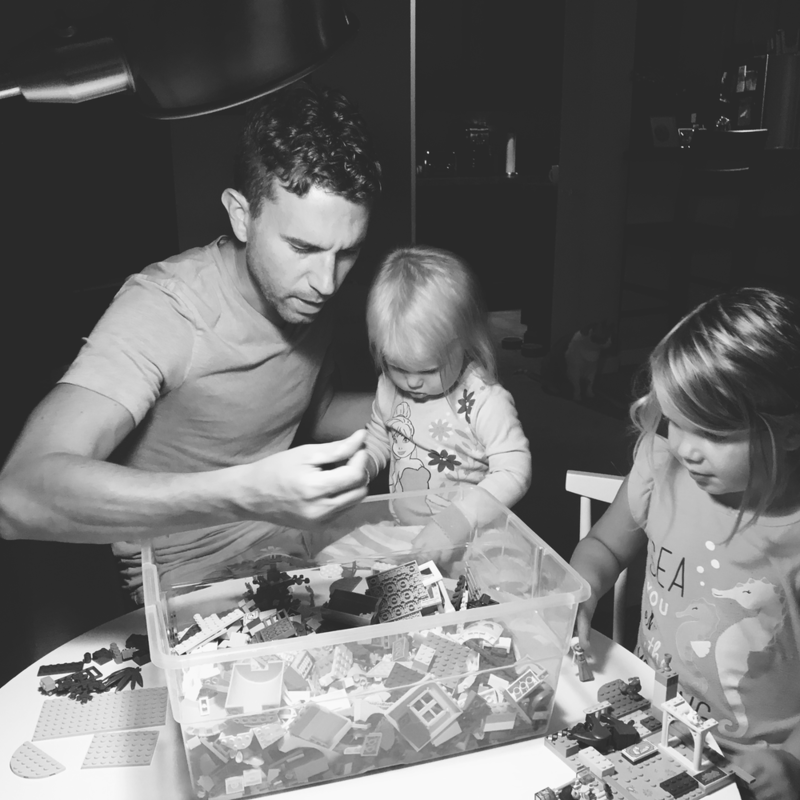 These advances allow for new and exciting ways to interact and create with LEGO. That being said, when you view a medium-sized set which was produced before the “age of detail,” - a model comprised of the simplest of bricks - it can occasionally make a more profound statement than the largest of sticker sheets ever could. This is certainly the case for the Black Falcon’s Fortress. It’s the kind of set which looks good in pictures, but great in person. Black Falcon's Fortress is a set which I’ve owned since I was a child in the late 80s, and it’s been at least twenty years since I’ve built the set. Still, I’m amazed at how beautiful and displayable the set is. There is one negative element to this set, however. Although the set certainly holds its own in the design and presentation department when compared to current sets, it does not do so in the area of stability. I’m sure it’s simply a sign of the times and the way sets were built back then, but this set does wobble quite a bit when used as a toy. Whereas today a number of additional Technic pins and side-studs would be used to make for a more solid structure, the Black Falcon's Fortress does not. For example, one piece of the castle wall is connected to the rest of the castle via only one Technic pin at the base of the structure which leaves the upper-most area of the wall completely detached from the set. I believe the thought behind this one-pin design is to make it easier for children to detach the pin and open up the castle for a larger play area. Nevertheless, I'm certain LEGO would have designed this play feature in more stable fashion, considering the modern LEGO product-scape. The set does include a couple of play-features. 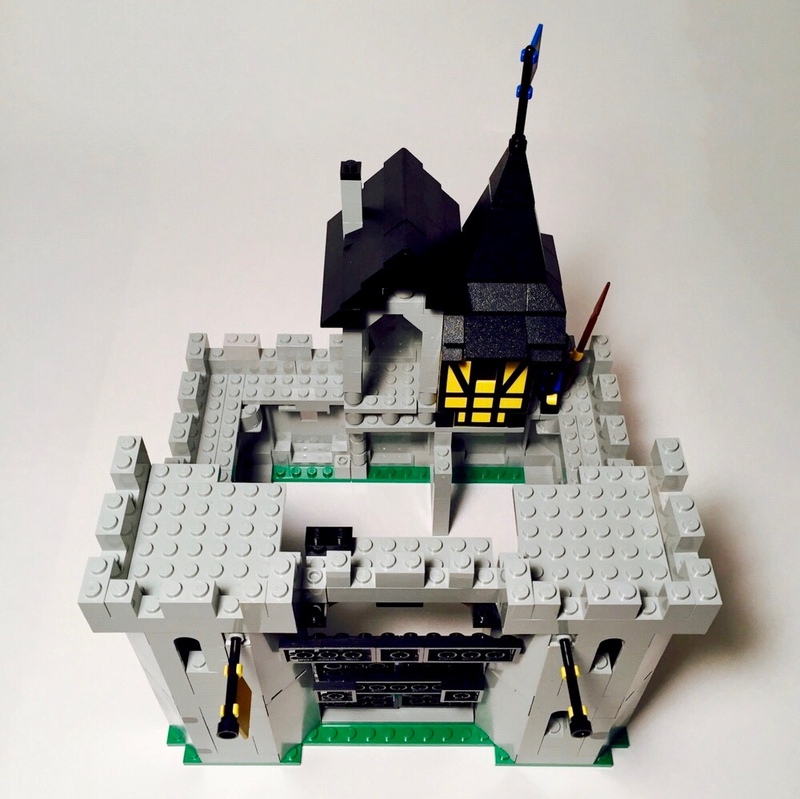 As I mentioned above, you do have the ability to detach a section of the castle and open the castle in order to make for a larger play area for your horses and your minifigures. The inside of the castle looks great and very believable considering how simply the design. Once the castle wall is detached, you have a number of various ways which you can position the castle for play or display. This is a fantastic play-feature. 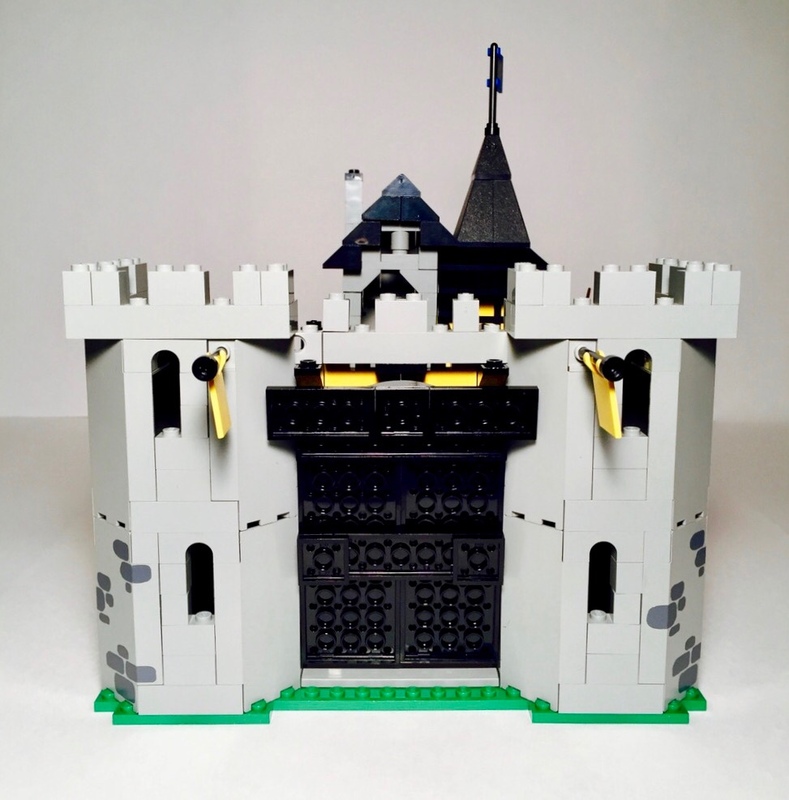 It turns this quaint, compact castle into a larger, more imposing structure for children looking to use this set for a good, old-fashioned castle battle. The second play-feature is the castle’s drawbridge. The drawbridge is a separate build which is connected by a pair of Technic studs and allows the drawbridge to actually open and close. I should note that originally this set did include some black string which could act to represent the rope or chains which would bring this drawbridge up and down. I have since, not surprisingly, lost or tossed the black string; however, I think the set looks just fine without it. I’m sure the string would add an extra element of realism, especially for display purposes. The minifigures included in this set are fantastic. 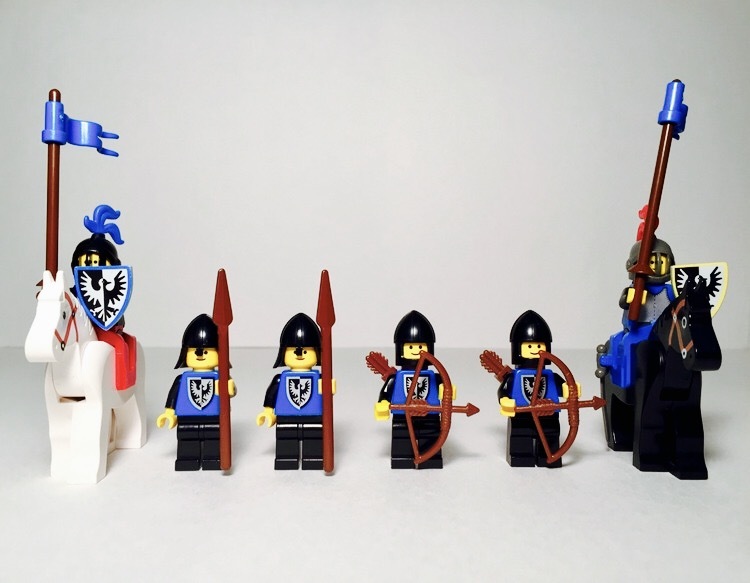 A total of six minifigs come with the set, including two archers, two spear-men, and two jousters. Each of the infantry men include a Black Falcons crest printed on their torso and some great battle-appropriate accessories. The jousters, as I’ll call them, each have their own distinct coloring and come with dark gray grill helmets, colored plumes, and their own horse. This wonderful set of minifigs along with the minifig accessories really boosts the overall play-value of the entire set. The beautifully simplistic design coupled with the overall play-value for children makes the Black Falcon's Fortress a fantastic set for both play and display. 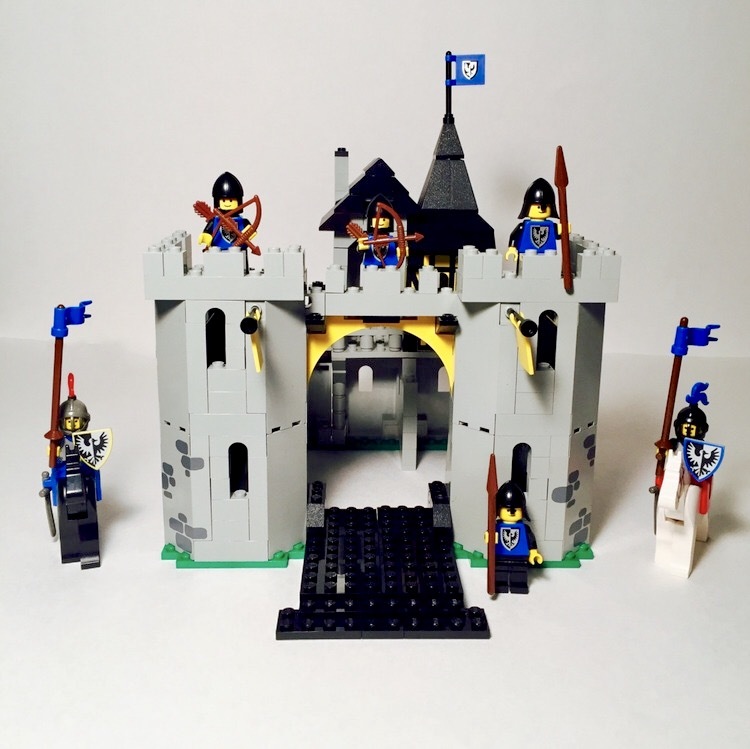 If you don’t own this set and you are a fan of the LEGO Castle theme, this set is worth tracking down. I’ll be leaving my set intact and on my shelf for quite some time.